The congress will be held from 28th to 31st March, 2017 at Safari Park Hotel, Nairobi, Kenya. 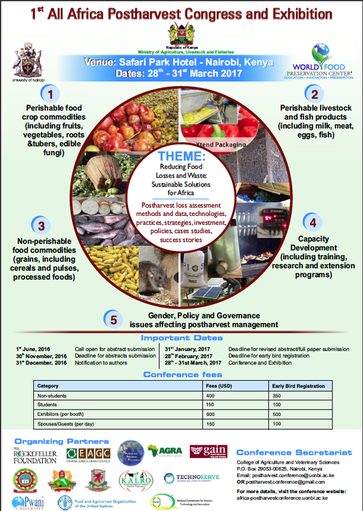 The conference theme is ‘Reducing Postharvest Food Losses: Sustainable Solutions for Africa’ and will bring together diverse stakeholders in the food supply chain including farmers, transporters and traders. Other targeted participants include researchers, academics, policy makers, technology developers and entrepreneurs in the public and private sector. The overall aim of the congress is to provide a platform where technology developers and promoters can interact with potential users, sponsors and policy makers with an ultimate goal of scaling up for wider adoption in an enabling policy environment. Success stories of technologies, practices, strategies and policies that have worked to reduce food losses in the African context will also be showcased. East Africa Postharvest Technology Challenge 2017. This competition seeks to identify 10 scalable innovations and technologies that address challenges in postharvest management of perishable commodities, livestock and fish products, and non-perishable produce, including grains, cereals, and pulses from the East Africa Community (EAC). The challenge is part of an upcoming All Africa Postharvest Congress and Exhibition scheduled for March 28-31, 2017 in Nairobi, Kenya. The event to be held under the theme, ‘Reducing Food Losses and Waste: Sustainable Solutions for Africa,’ is expected to attract over 400 participants from across East Africa. Young innovators from Rwanda, Kenya, Tanzania, Uganda, and Burundi can participate in the contest whose three top contestants pocket $30,000 in seed funding. Interested innovators can log on www.younginnovatorsinagribusiness.com for more information and competition guidelines.